Born 9 June 1947. died 7 July 2014, having lived with cancer of the mouth for some years. Andrew was a solicitor but stopped practising quite early. He became an International Master in 1988 and an International Arbiter in 1990. He was British Under 21 Champion in 1965. 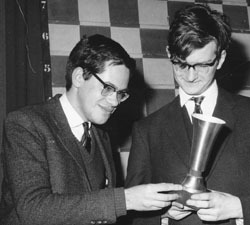 He won the Groningen Junior International in 1965-6 before that became recognised as the European Junior Championship. He came second in the 1971 British Chess Championship. He represented England in the Olympiads of 1970, 1972 and 1974, averaging 70%. He was English Senior Champion (60+) in 2008. He last played international competitive chess in Capelle-La Grande 2013. Andrew was one of group of English players, including Basman, Hartston, Keene and Lee who came to the fore at a similar time. Shortly after the crest of their wave, another stronger group came along, including Mestel, Miles, Nunn, Speelman, Stean. They built further on the achievements of their very recent predecessors. This was one of the reasons for the English Chess Explosion. Andrew was a member of King’s Head Chess Club for many years. That was almost a symbiotic relationship, celebrating the social relationships, the beer drinking and yet serious chess. Perhaps he was too genial ever to totally fulfil his potential as a chessplayer. He was a man who seemed at peace with himself. I asked him to write a short biography this year when he told me that his days were numbered. But perhaps he was no longer up to the task. At this stage we do not have further details, but will update this note when information comes in.